For those unfamiliar with the National Rifle Association (NRA) story it goes back to 1871, and was founded by veterans of the Union Army. They saw the importance of free Americans being able to protect themselves with rifles and pistols. Growing up I never heard anything negative about the NRA, if I heard anything about them at all. I played with toy guns and no one questioned that - all kids did in the 50's. A kid can die today playing with a toy gun - especially if he happens to be black. At one time, at least up until the mid 60's, the NRA stood for millions of average gun-owning Americans in the country. It was a patriotic organization unattached to corporations. But that rapidly in the 1970s with the political infusion of corporations. It quickly became money over safety. Those jolly merchants of death, the gun and ammunition industry in America, got in bed with the NRA, and as they say...the rest is history. 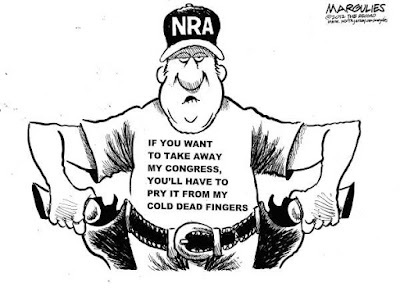 The NRA established it's own lobbying arm, the Institute for Legislative Action, in 1975. 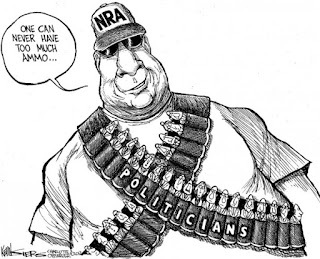 It also has it's own Pac called the NRA Political Victory Fund . For instance, gun maker Sturm, Ruger and Co. has been donating two dollars of every gun sale during 2015 and 2016 to the NRA’s Institute for Legislative Action — hitting its goal of selling two million guns earlier this summer. Likewise, Smith and Wesson contributed $1 million to the NRA’s Institute for Legislative Action last year. 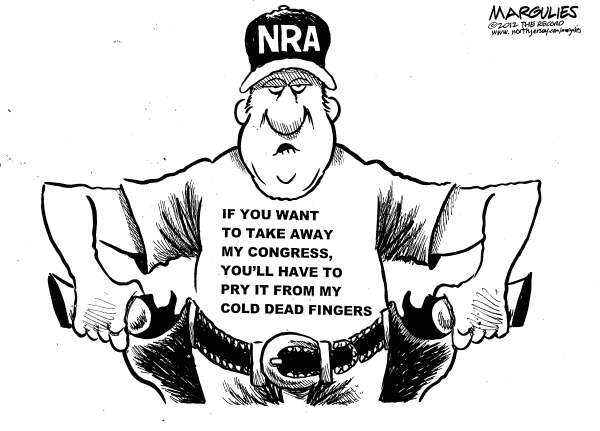 The NRA's iron grip on Congress after decades of corruption, is so complete that it's been almost impossible to pass safety or common sense laws to regulate firearm use/and, or ownership. It's no longer about the individual. Or common sense. It's about corporate takeover via crooked lobbyists. Millions of people listen to the NRA's propaganda wing and are convinced that they need to pay membership dues or the government will take their guns away. The biggest myth perpetrated by the NRA is that the government is going to take people's guns away. That myth alone has gone on for decades without Uncle Sam telling gun owners to surrender their guns. No jack-booted squads roamed through rural countrysides and city streets taking away people's guns. Hasn't happen, and it won't. Despite what the NRA says. Like many organizations that have been around for years, the NRA's original mission was righteous, but has changed for the worst. It's as ugly as can be. Americans suffer more gun deaths/mass shootings than any other country in the world every year thanks to the NRA's hold on our government. That doesn't look like it's going to change anytime soon.